The Little Engine That Could ~ The Bucky Channel - The World of Sports from Wisconsin's Perspective. 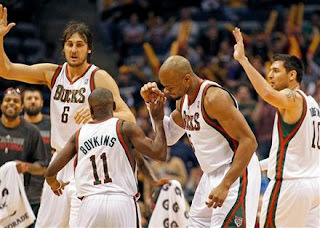 Down eleven points going into the third quarter, Earl Boykins decided it was his time to shine. The little man scored 11 of his 20 points in the fourth quarter to bring the Bucks back for a 98-90 win over the Hawks Wednesday night. When Boykins has it going, he makes it look so easy, and the other team has to be shocked with what he does. Milwaukee started the fourth quarter on a 22-3 run, with a meltdown like that you would think the Hawks had turned into the Marquette Golden Eagles. Things didn't look great in the first half for either team, and the Bucks had a scare when CDR went down hard. He was able to return in the second half, and said after the game his wrist was sore and that nothing felt broken. If this team wants to make a run here they can't afford another injury to anyone. The team they did assemble had 44 points in the first half, limped along still in the third quarter, but somehow found some offense to score 34 in the game's final stanza. Not sure where this sudden output came from, but we as the fans have been waiting all season for it. Milwaukee was 10-20 from three point land on Wednesday night, with Delfino leading the way with five of them. Corey Maggette had a nice game for the Bucks as well, as he was 8-12 from the field (3-4 from deep, 3-4 from the line) and had 22 total points. I like when Maggette takes shots around the 15 foot range, because him shooting any deeper from that comes off as if he is just trying to force the matter. Another star of this game was a result of just how depleted Milwaukee is due to injury right now. A kid named Garrett Temple, who played for three teams last season and was just signed to a 10 day contract with the Bucks, played 18 minutes, ending up with eight points, three rebounds, and three assists. Welcome to the show, kid. This weekend the Bucks better go 2-0, because they have the Raptors on Friday, and then the Nets on Saturday. That whole easy schedule thing is starting to show, and Milwaukee needs to take advantage of it bad. At 17-26 they are the 9th seed right now, but only two games out from the 7th. Clearly, the bottom spots in the East are wide open for any team to take. It is a matter of what team wants to step up, and make a run at it. With what the Bucks team knows they can do, I really don't see why they wouldn't buckle down for a big run here. But it's one game at a time as they travel to Air Canada Center Friday at 6:00 central time.